Dehumidifier with Pump. Which is the Best Dehumidifier with a built-in pump? A dehumidifier with pump included is useful but rare. We will look at why an internal condensate pump may be useful in portable dehumidifiers for home use and in situations where dehumidifiers are used outside the home, on a boat or in a second home for example. We will also describe briefly the leading models of dehumidifier with pump installed and give a short summary of our evaluation of each of these. If you would like to know more about one or more of these dehumidifiers you may see our detailed reviews of each model by following the links on this page. Why do You Need a Dehumidifier Pump? The first thing to say is that you don't always need a dehumidifier pump and that even when you do a dehumidifier with pump inside is not the only option. First some obvious facts. Dehumidifiers remove water vapor from the air by condensing it into liquid. This is called the "condensate". The water is collected in a bucket which must be emptied once or twice every day. When the bucket is full the dehumidifier stops, so failing to empty it allows humidity to rise again, defeating the purpose of using the dehumidifier. Sometimes it is not convenient to empty the bucket and for many folks it is just another chore they would rather do without. Every dehumidifier worthy of the name comes with a continuous drainage capability. There is a small outlet port in the dehumidifier casing for the water to come out. By attaching a small bore hose to the outlet the water can be allowed to run to a convenient drain, avoiding the need to empty the bucket. For most dehumidifier users this is all you need. The problem with continuous drainage on most dehumidifier models is that the flow of water depends on gravity. The drain must be below the level of the outlet in the dehumidifier and close to the appliance for drainage to be effective. If the water cannot drain the bucket fills up and the dehumidifier stops. If the only convenient drain is some distance from the dehumidifier, or at a higher level, a dehumidifier pump, known as a condensate pump, is needed to force the water over a greater distance, or to a floor above the site of the dehumidifier. If this is your problem there are two solutions; either you buy a separate dehumidifier pump, at between $40 and $80, or you choose a dehumidifier with pump installed. Whichever option you decide on please check carefully to ensure that the pump, or dehumidifier with pump, has sufficient power. If you need to raise the water to a floor above the location of the dehumidifier you will need a dehumidifier pump with a vertical lift of at least 12, preferably 15, feet. If you use a dehumidifier at a location distant from your main residence, a holiday home or a boat perhaps, and you have no convenient floor drain at this location, a dehumidifier pump is essential. On a boat, for example, there is a good deal of controversy about whether a dehumidifier can be drained into the bilges without risk to the vessel, so a pump could be desirable in some cases. The choice between a separate condensate pump and a dehumidifier with pump will depend on your personal preference. A dehumidifier with pump will be neater, and easier to set up, but the dehumidifier will be more expensive than others without pumps and your choice of model will be restricted. A separate condensate pump will be an additional cost and less tidy than the internal dehumidifier pump but, if the dehumidifier dies you will not lose the pump along with the unit. If you are considering a dehumidifier with pump installed the next section describes the choices that you have. Dehumidifiers with pumps are available in the USA under three brand names; DeLonghi, Kenmore (Sears) and Winix. 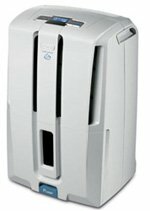 The DeLonghi 50 Pint Dehumidifier DD50P is a lower capacity dehumidifier than its name suggests. DeLonghi, as I am sure you know, is an Italian company. In Europe the conditions under which the water extraction capacity of dehumidifiers is tested are different from those usually applied by manufacturers and distributors supplying dehumidifiers to the US Market. Most dehumidifiers sold in the USA have been tested under conditions specified by AHAM (Association of Home Appliance Manufacturers). These conditions specify a temperature of 80°F and 60% relative humidity. In Europe the conditions are typically 90°F and 80% RH. In these warmer, wetter conditions the water extraction rate of a dehumidifier is roughly twice what it can achieve at the AHAM standard. The 50 pint capacity of the DeLonghi 50 Pint Dehumidifier was obtained under these conditions so, for comparative purposes, this dehumidifier is a 25 pint unit when compared with products from Frigidaire or Danby, for example. It is only fair to point out that DeLonghi also quote water extraction rates for their dehumidifiers under AHAM test conditions. We would not wish our visitors to purchase a dehumidifier that was insufficiently powerful which is why we have taken the pains to clarify this matter. The DeLonghi 50 Pint Dehumidifier is, nevertheless, a worthy machine. The pump provides a vertical lift capability of roughly 16 feet. Both dehumidifier and pump are well made, reliable and effective and, based on our own evaluation and dehumidifier reviews by consumers we are pleased to recommend this dehumidifier to our visitors. Also available is the DeLonghi DD45P 45 Pint dehumidifier which is identical in all respects except for its slightly lower water extraction capacity. There are currently four models in the Kenmore Dehumidifier range offered by Sears. Three, the Kenmore 70 Pint, 50 Pint and 35 Pint Dehumidifiers do not have a built in dehumidifier pump. Only the Kenmore Elite 70 Pint Dehumidifier offers this feature. The Kenmore Elite Dehumidifier offers, on paper, all the features you might wish for in a dehumidifier for your basement. We will not describe them here as they are all detailed in our review of this unit. Our concern is the large amount of evidence from consumer reviews that the dehumidifier, the pump and the humidity sensor are far from reliable. For this reason we do not recommend the Kenmore Elite 70 Pint Dehumidifier to our visitors. 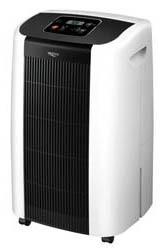 The Winix 70 Pint Dehumidifier is the larger of two dehumidifier models in the current Winix range, the other being the Winix 50 Pint Dehumidifier. These models are identical except for their water extraction capacity and both include a built-in dehumidifier pump with a vertical lift capability of 15 feet. 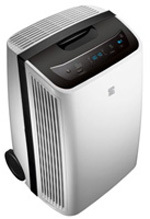 The Winix 70 Pint Dehumidifier has all the characteristics needed for an effective basement dehumidifier. Our assessment of this dehumidifier is that it is a thoroughly competent unit with sound performance, energy efficiency and reliability. In dehumidifier reviews consumers rate this dehumidifier highly and we have no hesitation in recommending it to our visitors. The Winix 50 Pint Dehumidifier is equally well thought of and we are pleased to recommend this model also, for slightly smaller basements. Reviews of both models are available on this site and although the link will take you to our review of the 70 Pint model our comments about both are very similar.